Looking for the perfect dessert? 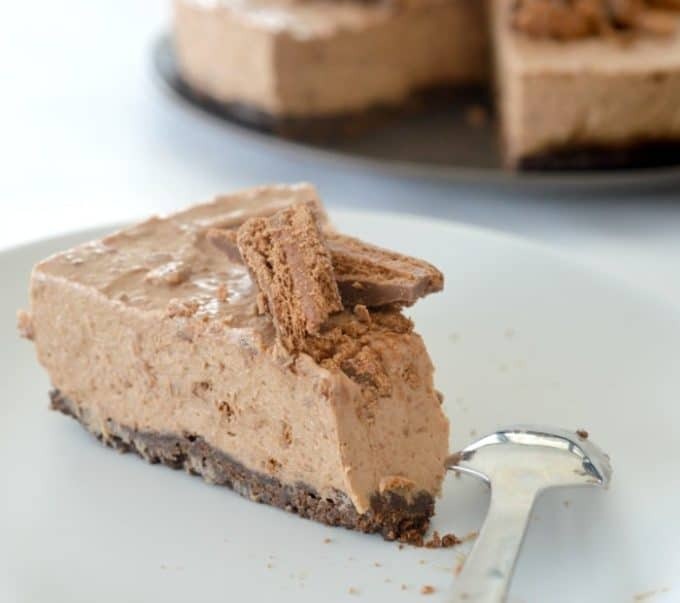 This Tim Tam and Baileys Cheesecake is for you! 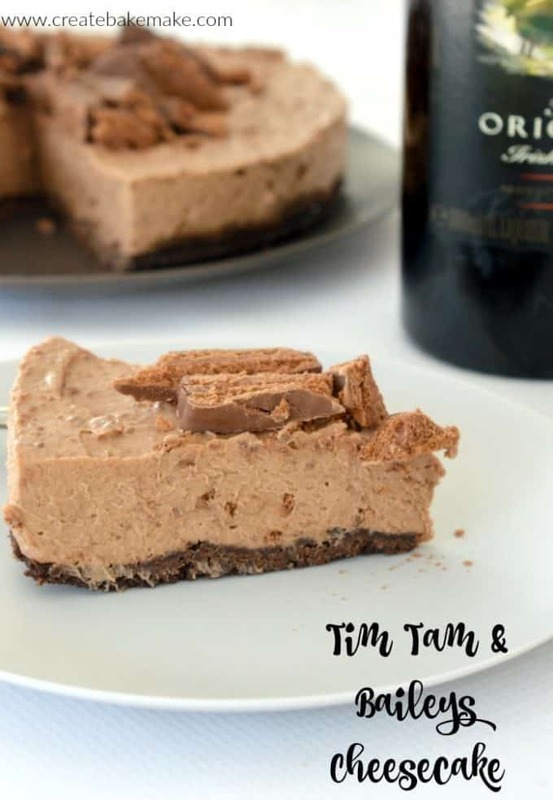 I’ve made a few decadent desserts in my time, but this Tim Tam Baileys Cheesecake would have to be the most decadent of all – seriously! 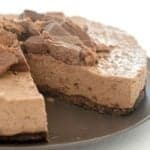 I knew that I wanted to try and make a Baileys cheesecake of some type and when my bargain hunter husband bought home FOUR packets of Tim Tams when they were on special recently, the decision was made for me! 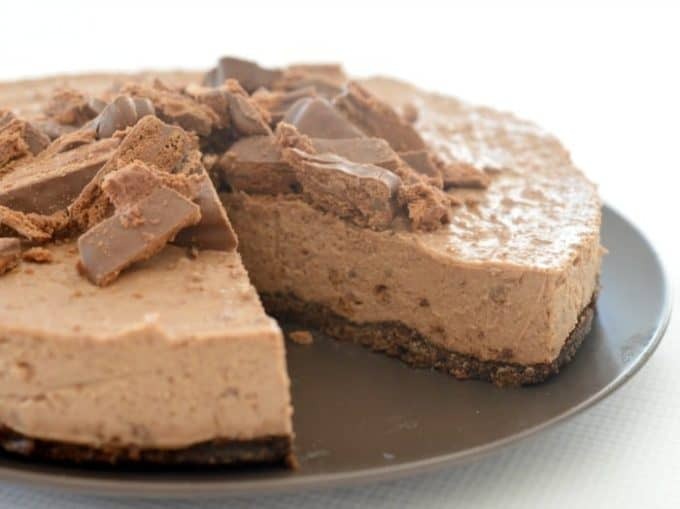 I based the recipe on my Maltesers and Mars Bar Cheesecake recipe and added around 1 1/2 packs of Tim Tams (yep, you read that right!) 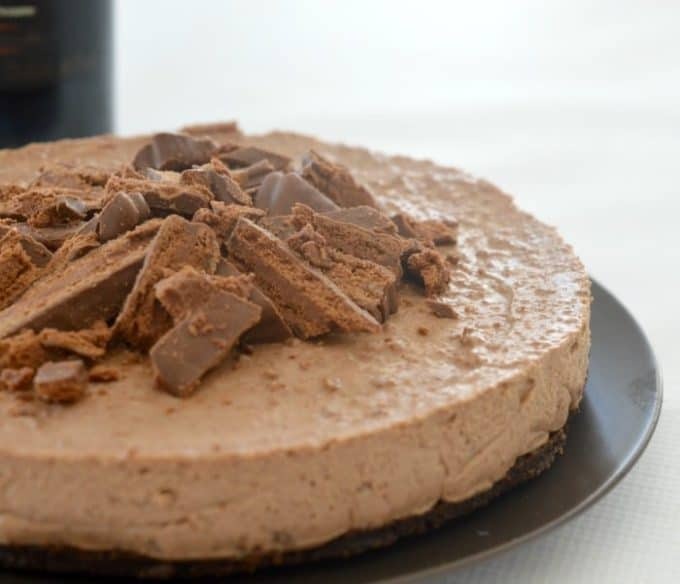 to the cheesecake itself, and then used the remaining Tim Tams to decorate the top – yum! The only mistake I made when putting this recipe together was making it when both of the boys were home with me and I had a terrible time trying to stop them from licking the bowl and then wanting to try a piece of this ‘grown up cake’. I had to end up hiding it up to the top of the fridge behind the water containers to stop them climbing into the fridge (yes that does happen in our house) to try and take a piece. Even after all of the Baileys recipes I’ve made so far, I still have around 1/3 of a bottle of the stuff left, I’d love to hear your suggestions on what I should make next! Line the base of a 22cm springform tin with baking paper and lightly grease the sides. Set aside until needed. Process the chocolate ripple biscuits (or similar) until the resemble breadcrumbs. Add the melted butter and stir until combined. Pour the biscuit mixture into your prepared tin and use a large metal spoon to cover the base with the mixture and flatten the surface. In the bowl of an electric mixer, add the softened cream cheese, cream, caster sugar and vanilla extract and mix on a medium to high speed or until the mixture is thick, creamy and smooth. Meanwhile, chop one pack of Tim Tams into pieces and place in a microwave safe bowl. Cook for 30 second spurts (stirring in between each cook) until they have melted. Roughly chop the remaining pack of Tim Tams into large chunks. Add the melted Tim Tams and Baileys to your cream cheese mixture and mix on a medium speed to combine. Remove the mixer bowl from the stand and add approximately half of the chopped Tim Tams and gently stir them through. Pour the cheesecake mixture over the biscuit base and top with the remaining Tim Tam pieces. Place in the fridge to set. Ideally you want to leave this overnight, but is should be ok after 4 hours. Remove the set cheesecake from the fridge and serve. Place one pack of Tim Tams into your Thermomix bowl and pulse on turbo for .5 seconds 2 – 3 times until broken into large chunks. Set aside until needed. Without cleaning the bowl, cut the butter in half and place into your Thermomix bowl. Cook for 2 minutes on 60 degrees speed 3 or until melted. Add the chocolate ripple biscuits and mix for 10 seconds on speed 9. Use your spatula to scrape down the sides and mix again for another 10 seconds on speed 7. Pour the biscuit mixture into your prepared tin and use a large metal spoon to cover the base with the biscuit mixture and flatten the surface. Break one pack of Tim Tams in half and place them in a clean Thermomix bowl. Chop them for 10 seconds on speed 7 before cooking for 3 minutes, 60 degrees, speed 2. Scrape down the sides of your Thermomix bowl and cook for a further 1 minute, 60 degrees, speed 2 or until melted. Add the vanilla extract, Baileys, cream cheese, cream and caster sugar to the Thermomix bowl and mix for 30 seconds on speed 5. Scrape down the sides and mix for another 30 seconds on speed 5. Add approximately 100g of the chopped Tim Tams you set aside earlier to the Thermomix bowl and mix for 20 seconds on reverse speed 2 to combine. Pour the cheesecake mixture over the biscuit base and top with the remaining chopped Tim Tam pieces. Place in the fridge to set. Ideally you want to leave this overnight, but is should be ok after 6 hours. The above mixing times may vary depending on the softness of your cream cheese and Mars Bars. I suggest using cream cheese and Mars Bars which are both at room temperature and are soft. This cheesecake is quite soft as it doesn’t contain gelatine. If your cheesecake is too soft or runny when you cut it – pop it back in the fridge to let it set for a bit longer. Ypu nailed it! This is all my edible Christmas dreams come true! If you need to use up the rest of the bottle, why not try a baileys and white chocolate panna cotta with honeycomb crumb. One of my favourite recipes. Could you use salted caramel baileys with this instead of normal baileys?